Michelle Williams has been outspoken about her bouts of depression. Now she is revealing that at times she felt suicidal. "At the age of 25, had I had a name to what I was feeling at the time, I would have disclosed that I’ve been suffering from depression,” she said on Wednesday's episode of The Talk. "I didn't know until I was in my 30s what was going on. I just thought it was growing pains." The former member of Destiny's Child said she even tried to talk with her manager at the time -- Beyonce's father Mathew Knowles -- but he didn't understand. "When I disclosed it to our manager at the time, bless his heart, he was like, ‘You all just signed a multi-million dollar deal. You’re about to go on tour. What do you have to be depressed about?'" she recalled on the show. "So I was like, 'Oh, maybe I’m just tired.'" "I think he wanted me to be grateful, which I was, but I was still sad," Williams, 37, said, adding that she was "to the point where I was suicidal." The now gospel singer said Wednesday that she revealed her depression in 2013 by happenstance. That same year, Williams spoke about her battle with the mood disorder on "Good Morning America." 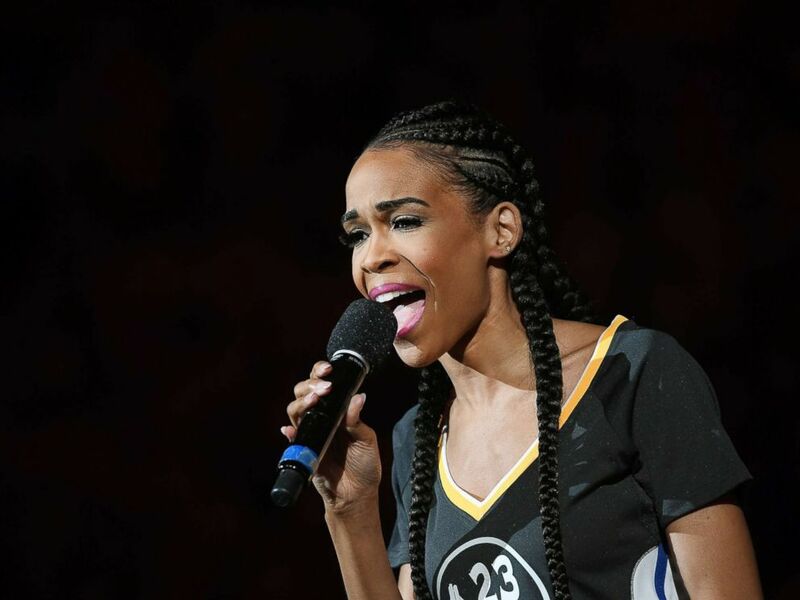 American singer, songwriter and actor Michelle Williams sings the National Anthem prior to Game One of the Western Conference Quarterfinals 2016 NBA Playoff game, April 16, 2016, in Oakland, Calif.
"When I brought that up, it wasn't planned, it was strategic," she said on "GMA." "Now that it's out, I just want people to know that it's OK to go talk to somebody. It's OK to go get some help." After the episode aired Wednesday, Williams thanked the daytime talk show on Twitter. She also clarified some headlines that incorrectly stated she wanted out of the group during that dark period of her life. "I’m so thankful for the support! I just ask that the headlines and quotes reflect what I said," she wrote. "I didn’t say I 'wanted out of the group.'"